If you have ever worked with AccuDraw you know keeping the focus in the AccuDraw dialog can be troublesome. 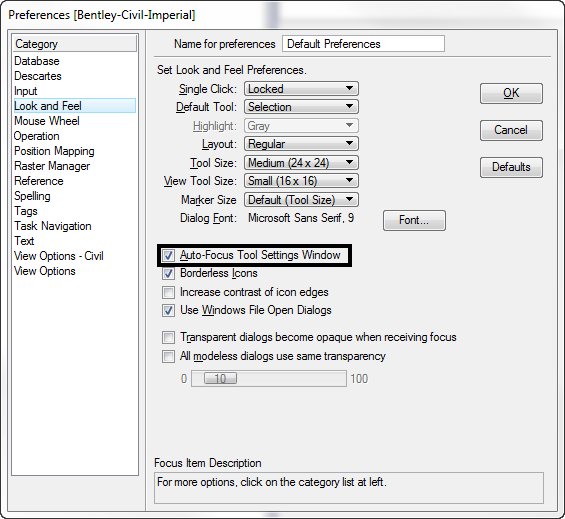 There is a setting in the Preferences that can make it easier. 2. Check ON the Auto-Focus Tool Settings Window. Try it out by selecting the Move or Copy icons. Notice how the focus stays with AccuDraw dialog. With this setup the focus will stop going Home. If you want to go to Home so you can use your positional keyboard mapping press the Esc key. To get the Key-in Browser dialog focus press the Esc key then Enter key. To get to the AccuDraw dialog press the Esc key then Spacebar. To get focus back to the Toolsettings Window F10.